On An Overgrown Path: Should classical music turn up the bass? Should classical music turn up the bass? BTW, regarding your most recent blog post about attracting young people to classical music, Jonathan Harvey's comments mirrors something I've been saying for years, that classical music is lacking bass. That was one of the first things I noticed when I switched from being a blues/rock fan to a classical fan was that one expects to have a visceral experience at a concert. That blasphemous email arrived from composer and techno-maverick Jeff Harrington. Or is it blasphemous? There is a strong correlation between the popularity of works such as the 1812 Overture and Ravel's Pictures at an Exhibition orchestration and their bass content. And Gustav Mahler, Arturo Toscanini, Wilhelm Furtwängler, Leonard Bernstein, and Dmitri Mitropoulos all agreed with Jeff and turned up the bass by performing the quartet repertoire with string orchestras. Above is the LP release of Bernstein's recording of Mitropoulos' version for string orchestra of Beethoven's Op. 131 Quartet. It uses 18 first violins and 12 cellos, but selective doubling of the cellos by the basses is the only change to the score and there are no alterations to Beethoven's dynamics. In the now deleted CD transfer the Op. 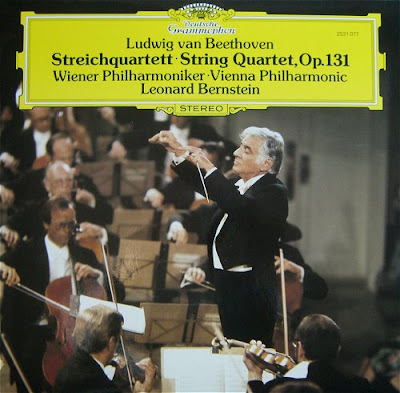 131 is coupled with Bernstein's own string orchestra version of the Op. 135 Quartet which again uses some doubling of the cello part. Turning up the bass also touches on another recent thread. Mobile media and miniature speakers are the enemy of properly articulated bass, as are the wretched 'ear bud' transducers used with most iPods, and as indeed are low resolution formats such as MP3. In his email Jeff also draws attention to an important piece of research by Jonathan Berger, professor of music at Stanford University, which showed that students preferred the sound of MP3 to higher quality formats because that they have become conditioned to the lower resolution format. All of which suggests an interesting experiment. It should be easy to emulate the signature sound of MP3 rock by reprocessing a classical recording with the top end frequencies cut, the bass boosted, the dynamic range reduced by compression and by mastering the result at a high level. Beethoven's Seventh Symphony lasts for around 35 minutes. So how about a CD with two version of the symphony, one in audiophile sound, the other in a 'bass mix'? I think I know which version younger listeners would prefer. And before anyone cries 'blasphemy!' No, I am not suggesting all new releases should come in a bass mix. But remember, my suggested experiment simply uses new technology to do what many legendary musicians did in the past using the old technology of larger instrumental forces . This is a great idea/concept, but there are some serious flaws to how you suggest going about it. Firstly, MP3s and today's over-use of audio & data compression (and subsequent RUIN) of many popular songs is a bad bad way to create what (I think) you're looking for. You've got a good idea, but squashing the life out of it, and simply cutting the treble is only going to make a weak recording sound even more dreadful. Please don't add to the already-horrible casualties of the "loudness wars" with this approach. The answer is to take care of the bass component ahead of time; for starters, mic the basses properly during the multitrack recording. (Which is done routinely with many symphony orchestra, chamber music, quartets, & soundtrack recordings.) There is more flexibility in this approach than one might think, and can lead to some very powerful and rich-sounding recordings with excellent bass. While any good classical/acoustic music recording engineer would want to strangle you for suggesting audio compression, overuse of EQ and so on, there are still some things that can be done tastefully to keep the bass section rich and full, regardless of the genre or composer. While I doubt the creative forces behind making high quality classical and acoustic concerts and recordings want or care to appeal to the "rock/pop" mindset, many wouldn't be bothered at all by a fuller, richer bass section. I agree that many classical recordings - modern and vintage - lack a good full bass section. All too often, it's a case of not being missed so much as long as the notes are heard. When done properly, (and on a good playback system), you SHOULD hear the bass; all of it. I've never had a client tell me to turn down the bass when it's mic'd and mixed properly. Good powerful, full (and NOT overhyped/processed) bass is always welcome in classical/acoustic music. Ditto for live performances. While there may not be a bank of subwoofers onstage, you should be able to hear it relative to the rest of the ensemble, and if not, somethings wrong, or you need to change your seat. But of course, there's plenty of bass in live classical music. Harrington raises a question of physicality; for me, too, part of the essence of live music. There's nothing to match the hair-raising thrill of feeling a great wall of symphonic sound crashing over you - or the "wobble" in your stomach as a low double-bass note makes the air vibrate. But increasingly, with orchestral concerts, I get this experience only in smaller, older halls: Birmingham Town Hall or the Liverpool Phil, halls "we" all tacitly or overtly agree are no longer really ideal for orchestral music. The modern, acoustically designed super-halls of the 80s/90s/C21 deliver crystal clear sound but not a hint of that vital physicality. Is this perhaps because halls are now being designed to mimic digital CD recordings - rather than the other way round? Is this, maybe, why many current classical recordings and live performances can feel so arid, so sterile and so pristine? And if so, have we lost something of the messy, physical, imperfect qualities that help music connect with us as human beings? And how can we get it back? Halldor, thanks for that. You are quite correct to raise the subject of 'bass light' concert halls. I had originally planned to touch on this in my post, but it was dropped in an attempt to avoid 'article inflation'. Another interesting example of turning up the bass comes from Elgar. In his own performances of his Second Symphony the composer would add a 32 or 64 foot organ pedal for 8 bars if it was available. I wonder if the issue is not the importance, rather than the volume, of the bass line. My sense is that 80s disco music like Earth Wind and Fire learned a lot from counterpoint and basso continuo, and the repeat bass phrases we see in pop music bear more than fleeting similarity with the repeats in baroque. To take just one example, Soler's fandango is almost a pop hit in part because of its repeated bass figure. As a 20th century pop hit, of course, it would receive an amplified bass, but the point is that the bass figure is already, prominently, there. I would refrain from adopting loudness approach and cutting treble region for perceived bass boost. Records from Telarc, Naxos are a testimony that proper recording and mastering is what is missing along with lack of proper fortified bass section in concerts. I hope future recordings incorporate some kind of LFE channel like in movies to give us that extra bit of extension,slam in the bass department.